Wedding Dress Storage Tips For Your Daughter? Wedding is one of the most auspicious events in the life of the bride-to-be, your daughter. Preserving a wedding dress is an emotional thing. It is done to pass on emotional links, and blessings of the ancestors for the welfare of their children, in this case their daughters. 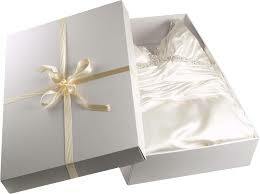 Here are a few tips to store a wedding dress for your future daughter. The wedding dress that needs to be passed on to your daughter when she comes of age will be lying folded for a long time. Therefore, ensure that you don’t fold the dress haphazardly in the wrong places. You don’t want your daughter end up wearing a large crease down her torso, would you? Tip- First wrap the sleeves beneath the bodice. Now fold the back above the skirt. Post which wrap the skirt above the bodice. In this way you are only creating folds towards the seams that does not spoil the look and feel of the overall dress. You do that by placing tissue paper layer between every dress fold. This prevents the different layers of fabric from getting in contact. This is extremely vital is the dress boasts embellishments like beads, sequins, and other scratchy materials. In a large box. Yes! Many brides have a perception that best way to store a dress is to hang it in a garment bag. However, the best way to store it is in a large box but not before you fold it, and place it flat in the large box. Avoid using plastic materials that stains the fabric, also leaving your gown smell like stale. Get wide storage options from our storage and moving services.